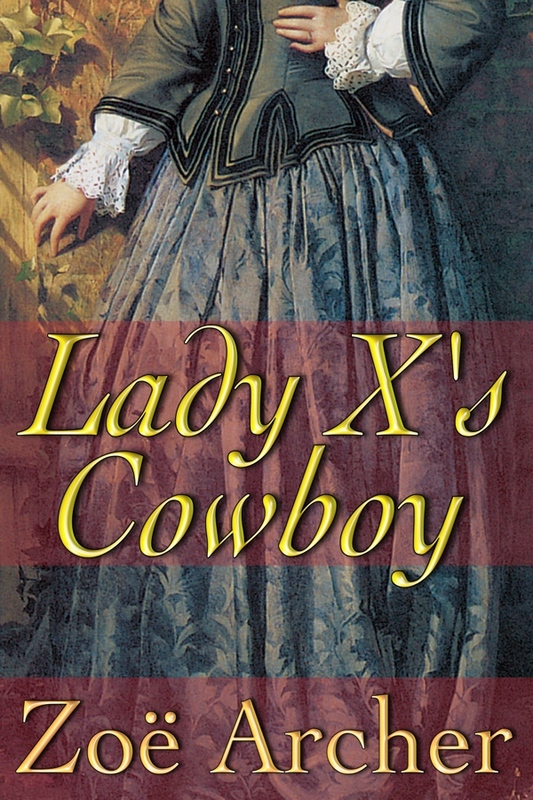 Constrained by her life as a Society widow, Lady Olivia Xavier finds escape in two unusual ways: as the owner of a successful brewery, and as a secret reader of penny dreadful Western novels. But Olivia’s beloved brewery is being threatened, and she has no ally in her fight. Until a mysterious cowboy steps out from the London fog, saving her from a terrifying brawl. Suddenly, Olivia isn’t just reading about the Wild West, she’s living it. Colorado cowboy Will Coffin has made the long journey from his Rocky Mountain home to discover his birthright. While searching for his family, he encounters the beguiling Olivia. Will’s never met a real English lady before—certainly not one as lovely and courageous as Olivia—and he can’t resist coming to her rescue. 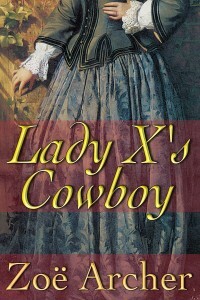 Lady X’s Cowboy was originally published by Dorchester in 2006 and is newly revised by the author. The decision had been made in an instant. As soon as Olivia and Will Coffin left the horrible squalor of his lodgings, she knew immediately what she was going to do, what she had to do, and she hoped that the sureness in her voice didn’t betray the uncertainty she felt in her heart. And so, without knowing much about him beyond his name, she invited the American to lodge at her home for the night. “After all,” she explained as they rode towards Bayswater, “there are no fewer than four unused bedrooms, and it would be a terrific waste to leave them unoccupied.” Another plan was ripening in her mind, but she wouldn’t give voice to that—not yet. “Four, huh?” Coffin tugged thoughtfully on his mustache. “Seems like a lot of land lying fallow.” Still, she could see that he wasn’t entirely convinced. Her heartfelt request seemed to win him over. “You sure I won’t be causin’ you any trouble?” he asked. “None, whatsoever,” she answered firmly. Which wasn’t entirely true. The physical logistics could be easily managed, yet she could not help wondering what the society wags would make of Lord David Xavier’s widow giving temporary accommodation to an American man she had met, literally, on the streets of Wandsworth only the day before. It could cause a minor scandal. “That’s very obliging of you, Mister Coffin,” she answered, and somehow a smile worked its way onto her own mouth. He did that to her—made her want to smile without really knowing why. “I’ve got somethin’ that belongs to you,” he said. He reached into the pocket of his long coat, forcing him to lean forward a bit. She pressed herself lightly back into the squabs without thinking. He was such a big man, his size and physical presence nearly overwhelmed her. Will Coffin had an air of living on a much larger scale in landscapes that could barely be contained by her imagination. She would be frightened of him if she didn’t know that he was, by her own words, a gentleman. Yet as he moved back to pull something from his pocket, she felt herself relax a fraction. There was something unpredictable and raw about him, that thrilled her even as she recoiled from its strangeness. “This is yours, ain’t it?” He held something out to her. She looked down and saw the yellow paper cover of Lorna Jane of Glittering Gulch sitting in the cup of his generous hand. She flushed. She didn’t admit her love of the cheap little books to anyone. They were the reading material of the great unwashed, those without literary discernment or taste, who valued sensationalism over intellectual refinement. Whenever anyone asked her what she was currently reading, Olivia mumbled something about Trollope or Ruskin’s edifying essays, while The Laughing Ghost of Killcross Manor; or, Love’s Revenge sat silent and accusing in her bedside table. Will Coffin had already put the book into her hand, and she stared at it with hot cheeks. “I beg your pardon?” she asked, more stunned than offended. He straightened, then shifted around on the seats which had been, only moments earlier, perfectly comfortable but now could not fully contain the length and breadth of him. “That I smell like a book,” she finished. “No, the book smells like you. The jasmine perfume or toilet water or whatever it is you call it, and orange, and somethin’ else. You,” he concluded. “Ah, well,” was about all she could manage as she slipped the book into her reticule. It was such a personal observation—no one she knew would ever admit to having their own scent let alone acknowledging someone else’s. Surely in their six years of marriage, David learned the different notes of her own smell. But such knowledge was intimate, reserved for only a spouse and valet or maid. Somehow, Will Coffin knew her enough to trace her scent—and the visceral animality of this turned her blood hot and sluggish. “You like readin’ about cowboys,” he said. When she didn’t answer, he pointed to her reticule. The corner of his mouth turned up and disappeared under the wide brush of his mustache. “You don’t think so,” he pointed out. “Like cowboys,” he said with a grin. “Like cowboys,” she answered, smiling right back. They could have gone right on smiling at each other if the carriage did not stop in front of her house.